The days from late December until early January were filled with traditions, many of which had been transplanted from the colonists places of origin in Germanic Europe and influenced over time by their new homeland in Russia. At the approach of the Neujahrsfeier (New Year's celebration), it was time to not only remember all that had happened in the year just past, but also a time to look forward with hope to the year ahead. From December 25th to January 6th, each of the 12 days predicted the weather for the coming 12 months. For example, the weather on December 27th represented what was to be expected in March of the next year. Others predicted the weather based on the observation of onion skins sprinkled with salt. Many marriages took place during the week between Christmas and New Year's Day. The traditional wedding date was the second day of Christmas (December 26th) when multiple couples would gather to take their marriage vows. The New Year's celebration began with the Neujahrsmesse (New Year's Eve church service). The service was held in the schoolhouse because the church in Norka was closed during the winter due the difficulty of heating the large wooden church and the ever present danger of a fire. As the worship service ended, the bells in the tower rang loudly signaling a farewell to the old year. In Norka, the Christkind (a young woman representing the Christ Child) made an appearance as she did on Weihnachten (Christmas). On this holiday, the Neujahrsmann (the New Year's Man) also visited the village. The Neujahrsmann was a tradition brought from the colonists' homelands in the 1760s. This character went from house to house and wished the residents good luck and blessing in the coming year. In return, he received a small token of money, or a drink of vodka or schnapps. At midnight, the Neujahr (New Year) was also received with the ringing of bells. All the men in the village celebrated with a great enthusiasm and noise making. Adults greeted each other on Silvestermorgen (the morning of New Year's Day). Traditionally, the first "visit" would start between four o'clock and five o'clock in the morning at the home of the godparents, then they visited the in-laws, then aunts and uncles and friends. Beginning in the mid-1800s, those greeting a family often fired their shotgun (which was decorated with ribbons and loaded with the smallest shot) either into the air, or at the front door, to awaken the entire family. The greeter immediately opens the door and shouts "Good Morning" and then recognizes all of those present in the house, "Godfather and Godmother," "Uncle and Aunt Uncle," "Father-in-law and Mother-in-law," etc. The praised homeowners would then thank the greeters with vodka, cold snacks of sausage, ham, and salt pork, and small gifts such as handkerchiefs. O Jesu mache alles wahr! Oh Jesus make everything right! den Freuden, wünsch ich auch zum neuen Jahr. Gott wird eure Seel Versorgen. Amen, ja es werde wahr! Glück im Hause, Glück im Feld. I wish you joy in the New Year. May God nourish your soul. Amen, yes, it will come true! Happiness in the house, luck in the field. God has made everything in the home. The young people received copper coins or candy in thanks for their greetings. The greetings continued until dawn at which time the family would gather for the traditional New Year's breakfast of baked ham or mutton, thin pies, pastries, Grebble (a type of donut), and other special holiday foods. Prayers were said before the meal began. During the meal, musicians arrived and greeted the household with their clarinets and flutes and playing both folk and church songs. The musicians were treated to hospitality from the household and also given money (from 30 kopecks to one ruble) in appreciation. After lunch, at around 2:00 p.m., young people gathered for sledding on the streets, which continued into nightfall. There was also a large dinner on New Year's day which usually featured the winter courses of pork, homemade sausage, and potatoes. After the main courses were consumed they enjoyed Riwwelkuchen, Grebble, Pfannkuchen, Krümelkuchen (Zuckerkuchen), and special teas such as Süßholztee, Steppentee, and Schwarztee which were expensive and reserved for the holidays. They also enjoy kvass, fruit coffees, and a special caffeine-free coffee substitute called prips, which was made from roasted cereal grain. 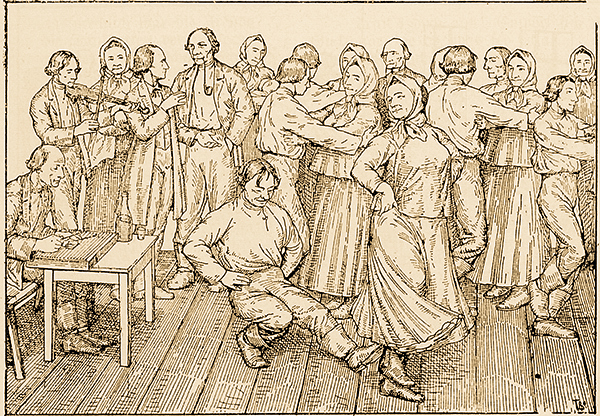 Of course, large quantities of vodka, schnapps, beer, and wine were also consumed while toasts such as Zur Gesundheit! (To your health! ), were made and folk songs were sung. After dinner, young people skated on frozen ponds until nightfall and then gathered in homes vacated by the adults to play music, sing, and dance. Adults met in other homes to enjoy many of the same activities as the young people. Late into the evening, everyone went home to sleep, content in the knowledge that the New Year was off to a good start. The following YouTube video is of a modern day Neujahrsmann making his rounds in Oberkalbach, Germany. Oberkalbach is located in the same geographic area where many families from Norka lived before emigrating to Russia in 1766. Listen to a recording of a Volga German New Year's wish (GFR0049.mp3) spoken by Mrs. John P. Geringer, courtesy of the Colorado State University, Sidney Heitman Germans from Russia Collection. Erina, E. M., and V. E. Salʹkova. Obychai Povolzhskikh Nemt︠s︡ev = Sitten Und Bräuche Der Wolgadeutschen. Moskva: Gotika, 2000. Print.